So today was the Reno Rock 'n' River runs, which I've done the half marathon at since it's inception three years ago (and two before that, when it was the Marathon de Mayo.) Since the second year of it, I've made it my big spring race and trained specifically for it - not finishing over 1:40 since then. Today was a little different - I treated it more like fun, and had a great time, despite a slower time. 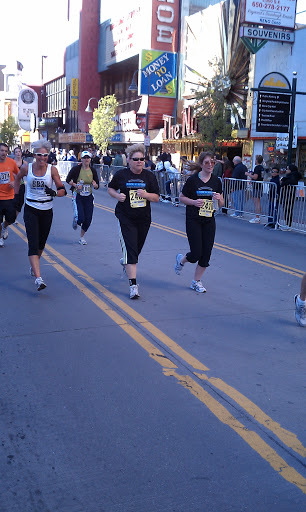 This was a Sunday race, so Team Library Dork was out in force. 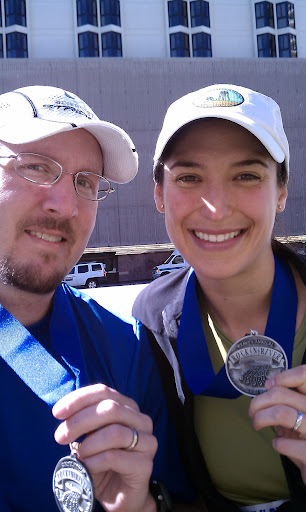 Amber, Dave and I were all doing the half marathon, while Chris wimped out and did the 10K (just kidding.) We were all supposed to meet at a certain corner near the start line, and Chris, Dave and I met up and scanned the crowds for Amber. Win only a couple minutes until the half marathon start, Dave and I gave up on her and shuffled to near the back of the pack. The gun went off, we shuffled some more, and eventually crossed the start and started running a bit. Dave and Chris came back, and brought some special treats - an Oak-Aged Espresso Yeti Imperial Stout from Great Basin Brewing. Yuuummmm. Enjoyed while sitting in the sun on the train trench in downtown Reno. Thanks, guys. After some confusion, including a flat tire on my bike and long lines at both restaurants we tried, we grabbed some calories and hung out for awhile. Great day, guys. TLD rules! Yaaah! TLD rocks! That picture of us turned out nice- great new phone you got there~ :) Thank you for running with me, even if I kept you from keeping your 5 year sub-1:40 time frame... I greatly appreciated the company! Well, we have never met but I am sure I saw you there. I was directing traffic and cheering people with my son at the Patagonia turn-around.